Tales of Slaves And Sweethearts: Black History Month brings several inspiring new books for children. Every year at this time, publishers commemorate Black History Month by releasing a round of new titles memorializing the struggles and accomplishments of African-Americans. Those aimed at children are especially worthwhile and deservedly find their way into the collections of public and school libraries. This year’s releases offer a potpourri of subjects that either celebrate black history through family stories of slavery and civil rights, or illuminate some of the lesser-known achievements of black pioneers. In “January’s Sparrow” (Philomel, 92 pages, $22.95), writer and illustrator Patricia Polacco tells the story of a family’s daring escape from slavery. Told primarily from the point of view of the family’s young daughter, the tale confronts violence and suspense head-on, amplified by pencil illustrations of the slave owner’s cruel beatings and the roiling river the family crosses to freedom. The audience for this book is independent readers, ages 10 and older. For tween and young adult readers, Linda Beatrice Brown’s novel “Black Angels” (Putnam Juvenile, 260 pages, $19.99) brings together two runaway slaves and one white boy, orphaned by the Civil War. Brown’s top-notch historical adventure depicts battle scenes in amazing detail, but she allows the three kids be themselves — homesick, bossy, brave and sometimes funny. 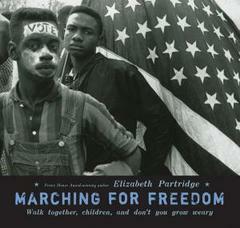 Using photographs of the Selma-Montgomery march, Elizabeth Partridge makes this iconic moment in civil rights history accessible to middle-grade readers in “Marching for Freedom: Walk Together, Children, and Don’t You Grow Weary “ (Viking Juvenile, 80 pages, $19.99). The book emphasizes the role children and students — sometimes scared and overwhelmed, but inspired by Martin Luther King — played in the civil rights movement. The proud memories and striking personal accounts of so many young people who risked going to jail may surprise some readers. 32 pages, $16.99) via simple, lively prose. The aviator and the mechanic swoop through the air in Holyfield’s paintings, narrowly escaping mechanical failure and prejudiced strangers, drawn with pinched, scowling brushstrokes. Marilyn Nelson’s “Sweethearts of Rhythm: The Story of the Greatest All-Girl Swing Band in the World” (Dial, 80 pages, $14.95) will interest older children, but its appeal spans all ages. Nelson uses poems to tell the story of an interracial, all-female swing band that played during World War II, and the book is lavishly illustrated by Caldecott Honor-winner Jerry Pinkney. The jazzy, dancing energy of the illustrations almost jump from the page and the bluesy rhythm of the poems creates its own potent music. Adults will have fun reading aloud — and learning along with their children. And some of Pinkney’s paintings of the female musicians are so joyous and bright, you’ll wish you could see them hanging on a wall, rather than relegated to the confines of a book.